Happy Valley Ranch is a non-gated North Scottsdale subdivision with custom homes, in the Pinnacle Peak area. Portales is a non-gated North Scottsdale subdivision with custom homes, in the Pinnacle Peak area. Desert Arroyo Estates is a non-gated North Scottsdale subdivision with custom homes, in the Pinnacle Peak area. Vistana is a non-gated North Scottsdale subdivision with custom homes, in the Pinnacle Peak area. Bent Tree Desert Estates is a gated North Scottsdale subdivision with custom homes, in the Pinnacle Peak area. Hermosa Heights is a gated North Scottsdale subdivision with custom homes, in the Pinnacle Peak area. Rawhide Estates is a gated North Scottsdale subdivision with custom homes, in the Pinnacle Peak area. The Desert Highlands area includes the guard-gated Desert Highlands community and several other communities along Halley Valley Road. Desert Highlands is an 850 acre residential golf community in North Scottsdale. Desert Highlands is located on the south slope of Pinnacle Peak, one of the area's prominent natural landmarks. Golf membership comes with home ownership and stays with the land. Current membership fee is $75,000 and is due at closing on a Desert Highlands property. 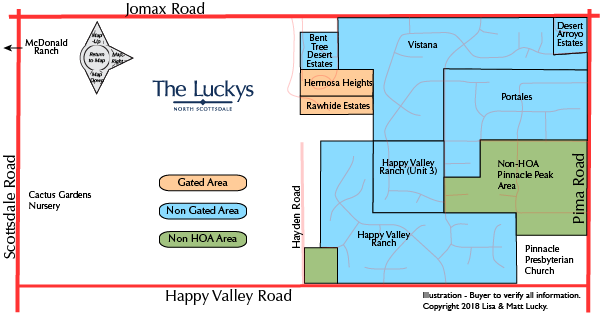 This is the Happy Valley To Jomax Map, in the Pinnacle Peak Area of North Scottsdale. Most homes in this Pinnacle Peak Area are on 1+ acres. The natural beautiful of the Sonoran Desert makes this area a special community. This is a great location close to shopping, dining, hiking, parks, and the 101 Freeway. See all Happy Valley to Jomax Area Sold.